Knytt of The Month #9? I didn't know about knytt stories when it came out, i only found out about it a year ago on jayisgames. 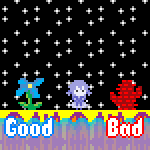 I sorta wanted to make a custom level or two, even though it's kinda dead. Would anyone be interested in doing another knytt of the month klub thing? i'll probably do something either way, maybe i'd even try to make one that would take longer than two hours, but it would be cool to do it along with other people. Sure! It'd actually be cool if we could do another collab like Rainy Day Adventure. that would be totally awesome too! I was thinking of that too, Rainy Day Adventure was the first custom level i played, i think. We did try another collab once before. I feel like if we set up another now it would take off, but it would be great if we could get Healy and TheCube on board again. But I'd really like to see another normal Knytt of the Month too. Probably it would be best to have one prior to setting up a collab. Maybe someone could set up an event for next weekend, if that works for everyone? you mean the 15th or 16th? The 9th sounds good to me! The 9th sounds good to me! Feel free to copy text liberally from previous iterations if you'd like. but I got to finish RPG stuff first.